Few restaurants can rival the ambiance of the great outdoors. Camped under sunshine and pine trees, a chorus of crickets in your ear. Your muscles sore from a day of hiking or swimming. And the warm scent of smoke off the fire. Without fast-food menus and microwaves, camping turns a simple meal into a major part of the overall experience. Traditional campfire meals might conjure memories of hot dogs or canned beans. Modern backpackers often settle for lackluster freeze-dried food rations. But with a little planning you can enjoy quality cuisine out in the woods. John Schwartz, store manager for Mountain Gear, says many of his favorite meals were cooked over a campfire. How ambitious you want to be may largely depend on the details of your trip. How many people will come? Where are you going? Will this be a light backpacking trip or a fully stocked RV campout? Inventory your weight limitations and plan your meals. Be prepared to pack everything in and back out of your campsite, so lose any unnecessary weight or bulky packaging materials. “You want to keep it simple,” Schwartz says. Much of the cooking can be done at home before you leave. Meat or rice can be precooked. Fruit can be dehydrated. Avoid foods that require refrigeration. If you bring food that requires refrigeration, you may be able to sink it in a nearby river or creek to keep it cool. Schwartz notes camping in the winter eliminates any refrigeration problems. Don’t forget some toasty beverages. A few packets of tea or instant coffee can provide easy, lightweight warmth on cold mornings. Always use a pre-established campfire ring or clear a spot away from ground brush and overhead branches. Many people have different preferences for arranging kindling and sticks to start their fires, but the most important part is developing an even bed of coals. Schwartz says coals will cook more consistently and make for a more efficient fire. 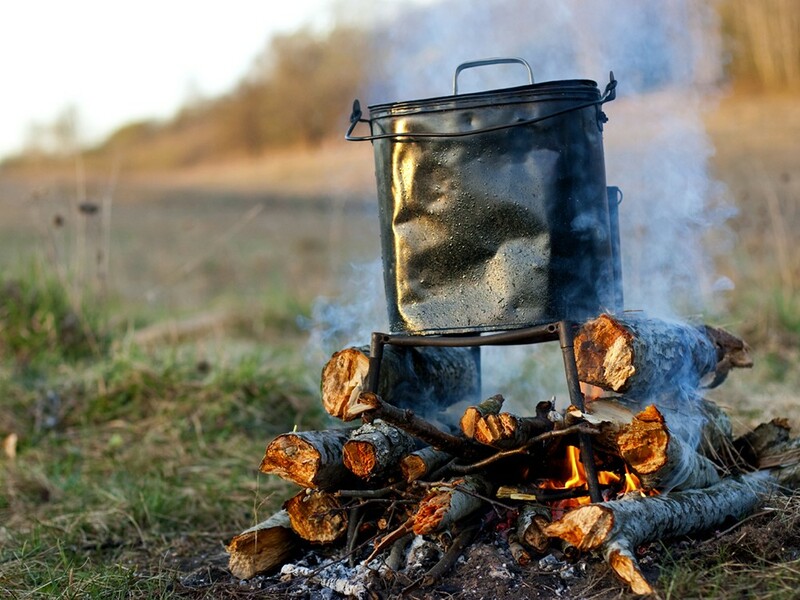 You can then heat food directly in the coals, grill over top or hang a cookpot from a tripod above the fire. “You do need one ingredient, though — patience,” he says. Rake your coals into different depths from shallow to deep, establishing varying temperatures from low to high heat. Use a stick to rotate coals as necessary. Make sure you have a reliable source of dry, hard wood to keep up the fire, Schwartz says. Do not pack in firewood. Buy or collect firewood from as close to your campsite as possible to help prevent the spread of bugs. Schwartz says many campers prefer small cook stoves that burn white gas, kerosene or other fuels. The light stoves heat more reliably and can be operated in campgrounds that do not allow fires. Do you want to be the camper nibbling jerky or do you want to enjoy a spread of salmon filet and peach cobbler? Schwartz says it’s all about preparation. “Me, I love spaghetti,” he says. Pastas make for easy but satisfying meals. Many hikers find themselves craving carbs after a long day on the trail. Schwartz says a Dutch oven works wonderfully over an open fire for breads, desserts or other treats. With a collapsible metal grill, you can cook over a campfire the same as any barbecue. Just load up your favorite burgers, kabobs or fish. Or put a frying pan on the grill for pancakes and eggs in the morning. Many foods — including potatoes, corn on the cob and fish filets — can be wrapped in foil and buried in the coals for a delicious slow-baked meal. Schwartz says he has made lasagna, coffeecakes and other gourmet fare. It just takes a little creativity. Be aware: Many areas of Washington and Idaho have a “burn ban” in place during the dry summer months of wildfire season. Before you count on cooking over a campfire, check the local restrictions on fires. Public campgrounds usually post any limitations on the use of campfires within their sites. You can also look up recent burn ban announcements on waburnbans.net and on the Idaho page at blm.gov. When burning a campfire, always keep a shovel and bucket of water nearby to put out any stray flames. Never leave a fire or embers unattended. Completely extinguish fires before sleeping or breaking camp.